I’ve only copied one thing that she did: keeping a stash of all different types and colors of wrapping paper, ribbons, stickers and cards. This comes in very handy when you suddenly remember your kid brother’s birthday – or a close friend whose special day slipped your mind. So, back to Xmas shopping: whether you’re a resident of New Orleans or here on a week-plus vacation, I think you’ll find some interesting gifts in the five stores I’m writing about here. This is a bookshop that declares, “we’re so much more than a bookshop” – and they’re right. They are located at 631 N. Carrollton Avenue (close to the Bean Gallery and City Park). They describe themselves as “a center for geeks and freaks where books and movies loved by nerds take the spotlight. They also have a game library of more than 200 games and, if one elects to join their “Board Game Club” it only costs $5 to play all day. This is a great spot for souvenirs such as clever T-shirts and cool bumper stickers (Make Wetlands. Not War). You’ll find this shop at 5631 Magazine Street. One of their voodoo T-shirts salutes religion and culture, meaning: it’s imprinted with a skull, an “X” and two hearts (one is broken, of course). Dirty Coast also has tea towels, tanks, hoodies, doubloons (don’t ask), a lagniappe collection (don’t ask), flags, candles, prints, hats, posters, socks, pins and postcards. In short: if you can’t find it here, you’ll never find it. I love the name – it’s so descriptive! Diva can be found at 2048 Magazine Street where there are three trashy boutiques side-by-side. There are also two locations in the French Quarter. If you’re looking for vintage clothing, you’ll love these spots. Diva’s specialty is sassy 1940s- and ‘50s-style hourglass dresses plus lots of corsets, retro tops, rockabilly wear, retro shoes, skirts and shawls. Frankly, I found the selection overwhelming – one could spend hours at Trashy Diva. Go and when you have to refuel, eat lunch and then return. This is another quirky place on Magazine Street – it’s at 3127. Funky Monkey is basically a funhouse for club-hopping men and women that stocks wigs, jeans, jewelry, tops, sunglasses, hats and boots. You may find floral heart shades, a gypsy pendant necklace, a jungle safari romper, or a sheer Betsey Johnson dress. Don’t forget: it’s a great spot for Mardi Gras costumes. 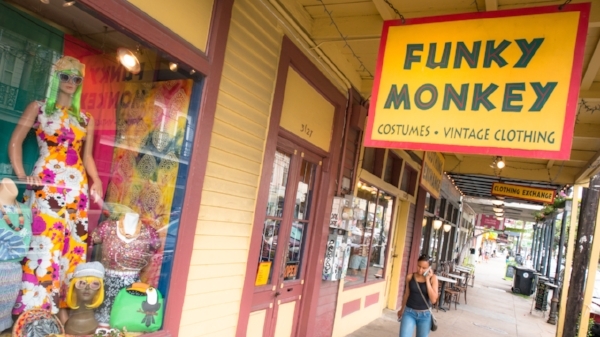 The Louisiana Music Factory at 421 Frenchmen Street is a one-stop-shop for all things related to Louisiana’s musical heritage. Their enterprising staff can get this type of music into your hands – you won’t be disappointed. COMING UP: Mardi Gras 2019 will be here before you know it! Where’s the perfect place to stay? Rathbone Mansions!